6 (six) Stacking Tray Palette. Convenient stacked porcelain trays for color mixing. The cover has the famous Royal Indigo dragon pattern. This set is perfect for your studio. It provides you large surface to mix color, yet separate individual color. The rough rim creates perfect seal to keep the color fresh longer. It is a Must an artist to have this set on your desk in the studio. 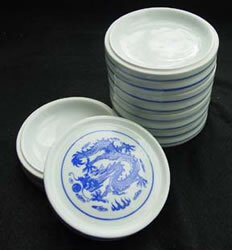 I have used these little dishes for a long time and find them to be essential in my work area. They stack when I don't need them and take up little space. When I need a small dish to mix just a little color, I grab one and I'm all set. It's big enough for several small tints or 1 large puddle! You can let it dry and reuse the color later. Or you can use the back for a tiny amount. They're indispensable! Try them. You'll like them. And they're pretty too! This "stack tray" is a great space saver in my small painting space. When I'm finished using a color I can put the lid on it,and come back later without a lot of trouble. Nice looking and a good price, too.